Despite rumors the Green Lantern Alan Scott would appear at the end of last season's DC's Legends of Tomorrow season finale, it turned out that the Justice Society member who came to tease season two was in fact Hourman instead. That led to a lot of speculation that maybe Green Latnern -- connected to the Justice League and the Green Lantern Corps, both of whom have movies coming out -- may be off the table for DC's TV universe. 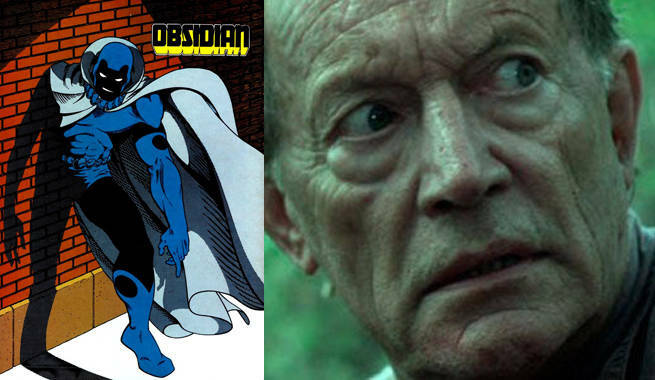 When veteran genre actor Lance Henriksen was cast as Obsidian -- Alan Scott's son from the comic books -- a lot of fans wondered just how much of the character's history would be carried over from comics to screen. In the comics, Todd (Obsidian) was abused by his adoptive parents, which made him unstable and not always the "good guy" in the early days. He also eventually came out of the closet, and -- as mentioned -- was the son of Green Lantern. So how much of this could possibly have stuck around for TV? "It's all in there. It's all in there, every bit of it," Henriksen told ComicBook.com. "Yeah, being Green Lantern's son and all that stuff and him being gay is all in there. It's treated, honestly, kind of ungently. It's a real thing....Even one of my lines says 'If you're lucky enough to find love again, after anything has ever happened to you, well, embrace it.' [Obsidian] says 'Son, he's waiting for me at home.'" Henriksen also noted that, as in the comics, Todd had a troubled past and "got up to no good" before settling into his role with the Justice Society. Now, whether we'll ever get to see Alan Scott onscreen might be another thing entirely, of course. But some fans will be happy just to know that the mythology is preserved, and hope for something like the brief cameo of Alan's ring on the Justice Society-themed episodes of Smallville.